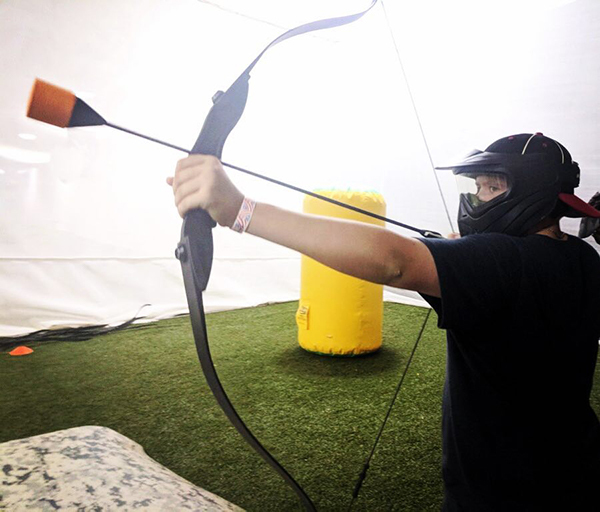 Conway Archery Warz, Laser Tag, And More! Archery Warz is the newest and coolest form of skill and athletics crammed into one fun game! It’s like dodgeball but with foam-tipped bows and arrows! 25lb bows send the arrows flying, so be quick to dodge, dip, and dive! Jack’s Ultra Sports is the only place in Arkansas with Archery Warz! Our bows are safe and only a 25lb pull. Knockdown your opponents’ targets while protecting your own like capture the flag, or tag them all out with your arrows like dodgeball. Either way, you win! Jack’s supplies the bows, arrows, and required safety masks. Get ready to dodge, dip, and dive! ARTKD brought our Black Belts to Jacks for some team competition and fun. The staff at Jacks were awesome, friendly welcome and great service. We showed up with 20 or so and our reservations went seamlessly. We had a few changes and they took it in stride with no fuss. Our people had an amazing time in both the laser tag and archery wars, in which many had never done anything like this. We give Jacks 2 thumbs up and highly recommend this for any of your team building needs or just a night out having fun with the kids. Archery, laser tag and escape room were a blast!!! Staff was very friendly and helpful. We will be back!! There is so much to do at Jack's! Our combo packages will save you money while maximizing the fun! Try our Ultimate Laser Tag, Low Impact Paintball, Escape Room and More! Packages starting at $24.99. Groups of 8+ please reserve ahead. Jack’s is the #1 place for Birthday Parties and Group Events! Share the fun, give the gift of Jacks! Have more questions? Check out our FAQ Page!